A boyband pop singer has been announced as one of the star’s lined-up for this year’s panto in Whitley Bay. Boyzone’s Shane Lynch is set to play Abanazar in Aladdin at The Playhouse, Whitley Bay, from December. 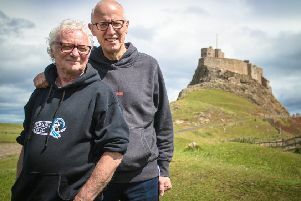 It’s the pop star’s first pantomime in the North East but he will be in good company with Tyneside entertainer Steve Walls playing Wishee Washee, whom he has worked with previously. Shane and Steve performed in Snow White at The Gordon Craig Theatre, Stevenage, in panto in 2005. With a supporting star cast, and stunning sets, glittering costumes, and plenty of audience participation, Aladdin promises to be the most spectacular pantomime yet. Aladdin is a traditional pantomime for the whole family with show times to suit all, and affordable ‘family special’ performances. The pantomime runs for almost a month from Monday, December 5, to Monday, January 2, 2017 ,with numerous different timed performances. Tickets are priced at £23 to £19 for adults £21 to £17 conc, family special £14 per person, groups £17/£16, youth groups £16/£15, £9 school performance.